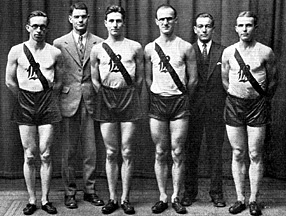 The 1930 relay team of Wallace Viles ’31, Ragnar Lind ’30, Russell Chapman ’31 and Norman Cole ’32; in coat and tie are (left) coach C. Ray Thompson ’13 and (right) manager David Spofford ’30. By the end of the 1920s, Bates’ string of winning track performances at the prestigious Penn Relays, held each April, had The Bates Student fretting about championship fatigue on campus. After the Bobcats’ victory in the two-mile relay at the 1930 Penn carnival — the second Bates title in three years, and in the top flight, no less — an editorial in the April 30 Student commented on the subdued celebration on campus: no parade “down-street” to meet the returning team, no bonfire atop Mount David. “Championship after championship comes our way…[and] the thing is beginning to pall,” the paper said. Words are feeble, for no use of them has yet been able to picture the inward emotions we feel, when someone to whom we have allotted a most difficult task has accomplished it in a manner that is nothing short of marvelous. As the [Hathorn] bell sounded the joyful news, our first impulse was that quiet, deep, stirring of the inner man that sends lumps into the throats and renders us unable to speak. Then comes the rush of pride for our champion and the pent-up emotions spring into a hilarious burst of enthusiasm and gratitude for the man who has brought us fame. The routine was repeated in 1925 after Bates teams won both a Class C and Class B mile relays: Parade gathers in front of Parker; students are “adorned in freakish costumes”; cannon shots announce the parade, which goes down College Street to Sabattus, right onto Main Street, then down Lisbon Street; Mayor Robert Wiseman speaks, promising that “the banner of Bates College with the name of each man on that relay team to be flown from City Hall tower for 10 days.” The party winds its way back to Bates, this time to the top of Mount David for a bonfire of logs, where coach Chester Jenkins praised the spirit and pluck of the Bates runners.